Personal – Patrick F. Clarkin, Ph.D.
I’ve been watching the news on current events around the world, including the massive wildfires in California that so far have killed at least thirty people and displaced hundreds of thousands. I know a number of people in the area, and even though they are not in the direct path of the fires they’ve been on my mind for the past several days. 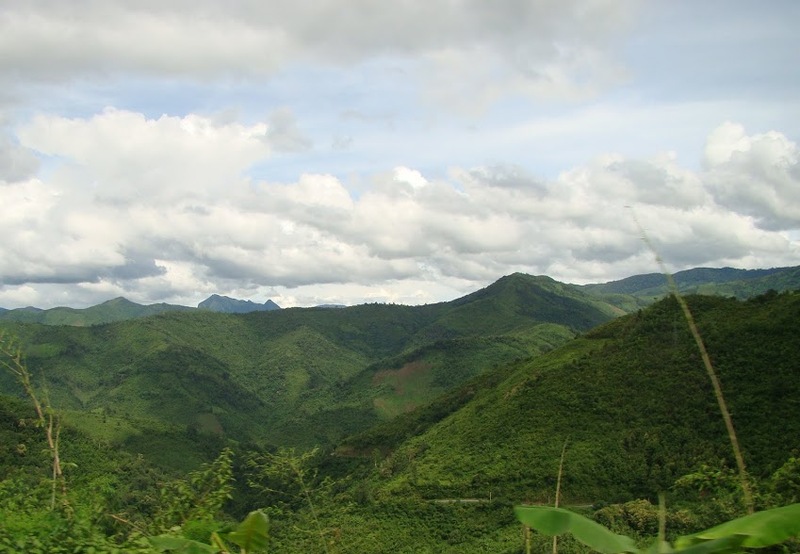 We’re still due to arrive in San Jose in just a few days for an anthropology conference, but it seems surreal to travel so far to talk about anthropology while there are many people suffering not too far away. From what I understand the smoke has traveled far and wide across the state. In fact, we just got an email from the American Anthropological Association reaffirming that the conference will proceed as planned, but also warning us that the air quality may not be suitable for older adults, young children, and people with health problems. Maybe that’s what we’re supposed to do—try to live life as normally as possible in times of stress. I’m not sure that it feels totally right, but I also donated to help some of the people affected (some suggestions here ). 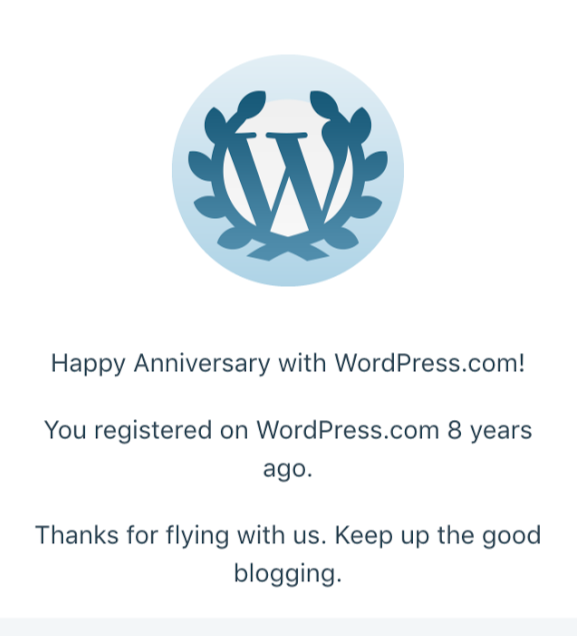 I just received notice from WordPress that it is the 8th anniversary for this site. To be honest, I have not been feeling too great about this site lately. Readership is down noticeably, and it has been harder to get the attention of my targeted audiences. I’ve even contemplated folding the tent. Surely, part of that is me, as I’ve found it hard to maintain the volume of essays compared to prior years. Perhaps it’s merely the nature of today’s Internet. Eight years ago, there were fewer personal blogs and sites to compete for readers’ attention, and people seem to prefer shorter, more digestible, essays before moving on to the next item on their list. I understand. Time is finite, and we have things to do. I’ll get back to writing fuller essays soon. In the meantime, go in peace. I’m planning for the American Anthropological Association annual meeting in Washington, D.C. later this year, and it struck me as unusual to hold it in that city again since the meeting was last there only three years ago. Next year, it will be held in San Jose, which was the host in 2006. I then got curious when the last time the meeting was held in Boston or New York, since I can’t remember the meeting ever being held in the northeast. Just for fun, I wondered if the AAA has preferred particular cities over its long history, since its first meeting in Pittsburgh in 1902. So, I made a heat map. 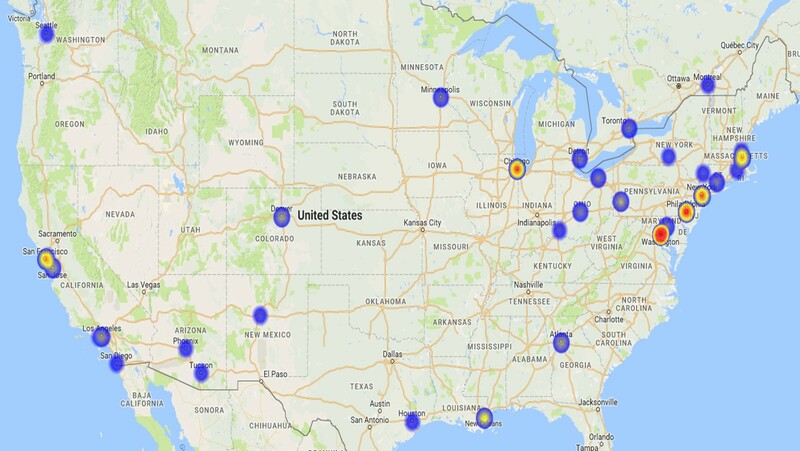 According to the AAA website, the city to host the meeting most frequently has been Washington D.C. (22 times, including this year), followed by Philadelphia (13 times), Chicago (11 times), New York City (10 times), then San Francisco/ San Jose/ Berkeley (9 times). However, things have shifted recently, with some cities not hosting for decades. The original host, Pittsburgh, has not been home to the meeting since 1966, while New York last held the meeting in 1971. Boston lasted hosted in 1955, and Los Angeles in 1981 (coinciding with Fernandomania). Several cities hosted only once, including my hometown of Providence, R.I. in 1910. By comparison, since 1990 New Orleans has hosted three times and San Francisco/ San Jose six times. The midwest, aside from Chicago, and the southeast have been largely overlooked. Saint Louis is due to host in 2020. I’m curious why Florida has never been the host. I thought they grew convention centers there, not to mention the warm weather, since the meeting is usually in late November. The meeting has also been held outside of the U.S. five times — Mexico City and Toronto twice each, and Montreal once. Vancouver, B.C. will host in 2019 for the first time. Anyway, this was all just out of curiosity. Heat Map of AAA Meetings (the map is zoomed in too close to see Mexico City, which has hosted twice). Jackie, rounding the bases. Three more bases to go. Yesterday I started the move to a new office just down the hall. I’d been in my old office since I started teaching at UMass Boston in 2003, and when a new office opened up I was asked if I wanted it. It has some advantages. It’s (slightly) larger than my old one, it’s off the main hallway (i.e., a bit more private), and it has a better view. But another factor is that I simply felt like moving. Sometimes change is good for its own sake — a breath of fresh air. To make the move easier, I did something I’m normally not too good at, which is letting go of things. I recycled a lot of old files and articles that I had held onto for years. Some of them I’ve kept since graduate school, even though I’d not revisited them in nearly 20 years. It felt good to dump them. I’d like to say that I don’t need anything. At an intellectual level, I understand that everything is impermanent — organisms, mountains, relationships, nations, memories, jobs, planets. Time devours all things. On the other hand, when we’re in the present moment, some things appear to be really important and worth prioritizing and holding onto. Maybe I don’t need anything. Except of course, the chair, the remote control, and the paddle game. And that’s all I need. So I do need some things.